© 2017 by Jaymee Goh. | Art © 2017 by Alan Bao. There was definitely something to be said about being Mrs. Lim, even into the Underworld: something about comfort, something about privilege, something about a status quo carried into the afterlife. The previous matriarch that bore the title of Mrs. Lim had moved on long before Mrs. Lim got there, but since Mrs. Lim had not liked the domineering nature of her predecessor, this did not bother her overmuch. One of things to be said about being Mrs. Lim was that during Cheng Beng, she received many, many presents. These many lush things from her children helped her keep abreast with the living world, to a certain extent. It was unusual for anyone to keep receiving Cheng Beng gifts so long after dying, but then, Mrs. Lim was of a family with unusually high expectations. Mrs. Lim was always vaguely pleased with the gifts. Her children were secular in their beliefs, but clearly not in their practice. Even an offering made automatically without any real intent behind it was something that contributed to her otherworld comfort. And if the gifts faded at their edges, who would notice, when she received so many? Even if she did receive fewer than she had before. Best of all, Mrs. Lim did not even have to share them with Mr. Lim, who had, as in life, been too full of overabundant energies to remain in the Underworld for very long. Once he had been satisfied that he had accomplished all he had meant to do in this life—the goals had been to expand his family’s business and raise fine children that would take over said business in order to produce fine grandchildren—he opted instead for Meng Por’s forgetfulness tea and went straight for reincarnation. So this had been the case, until the tenth year of her death, when she received from her daughter, Hong Yin, a coupon for a visit to the fish spa. Mrs. Lim turned the coupon in her hand over and over, confused at the invitation, and a bit annoyed. Couldn’t Hong Yin have sent her something more fitting for the Underworld, like new clothes? Mrs. Lim liked receiving them, just as she had liked buying them for the dead when she herself had been alive. Mrs. Lim didn’t want to confess, even to her best friend, that she had never been to a fish spa before, even in life. Hong Yin had not been a bad child, but there was something about her which had put her at odds with Mrs. Lim. Mrs. Lim always felt bad—for thinking that perhaps Hong Yin should not have been her child, perhaps Hong Yin would have been happier raised by her Auntie Blur, one of Mr. Lim’s distant cousins, who would have not noticed all Hong Yin’s strangeness, her difference from Mrs. Lim’s other children. Mrs. Lim knew that these were unmotherly thoughts to have, but they inevitably rose whenever Hong Yin sent anything during Cheng Beng. They had been acceptable, if odd, gifts at first: lingerie (pretty, but not appropriate for someone Mrs. Lim’s age); a flat screen TV (Mrs. Lim had not been disposed to watch much TV when she had been alive); a house in some strange contemporary style (also an impetus for Mr. Lim moving on; if their youngest child could afford to send a house, then his work was truly done). But Mrs. Lim had never rejected any of her children’s gifts, dead or alive, and she saw no reason to reject this one. So she went to the fish spa at the ghostly address her daughter had dreamed up for her. Luckily, the Underworld being an existential state with no fixed geography, there was no need to call a taxi. “Mrs. Lim,” she said tersely to the ghost receptionist. Once upon a time, if anyone had asked her, she would have said to call her Ah Wen, or Auntie Wen. Perhaps even Xiao Wen; she always thought she had a pretty name. But she had the fortune to marry into the leading Lim family, the first son even, and Lim Teck Meng towered so large in their circle of friends and acquaintances, Xiao Wen quickly became Mrs. Lim, to distinguish her from the other women who married into that illustrious family. The Mrs. Lim, who managed to bag a rich husband despite looking so boring and plain. The Mrs. Lim who herded her three children into successful adulthoods and an entire extended family into successful annual reunions. The Mrs. Lim who was her husband’s most stalwart support. Mrs. Lim remained Mrs. Lim into death; she saw no reason to give up the name, even into death. The server, who doubled as a masseuse apparently, showed her where to put her shoes, rinse her feet, then step up to the platform around the fish tanks where she could sit down and stick her feet in. The fish swarmed around her feet immediately. She jerked her feet away from them, jostling the water. She sucked her teeth in annoyance. Perhaps she was doing this wrong. Perhaps she was supposed to sit still. The fish circled about her feet, wary after her initial reaction. When they began their work again, Mrs. Lim waited for the expected ticklishness. Did ghost feet feel ticklish? Mrs. Lim had never considered this before. She watched in fascination as the ghost fish performed their duty in death as they must have in life. They were not real, and Mrs. Lim knew that they should be, in their own way. What did real fish feel like? Why did she not know? Why had she never known? She jerked her feet away from the fish, glaring at them in lieu of glaring at Hong Yin. Difficult Hong Yin, who asked stupid questions even though she was clearly so smart, who picked fights over such unnecessary things. Why should Mrs. Lim have known such things? And why should Mrs. Lim think about them now that she was dead? These thoughts did not leave her when she left the fish spa, utterly unsatisfied with her visit, and thus, with Hong Yin, who had failed to deliver a satisfactory Cheng Beng gift. She went to visit Ah Fong to complain about it. “Ah Fong!” Mrs. Lim was scandalized. Mrs. Lim dropped the subject. The next year came the usual gifts: new clothes, a Gucci handbag, a laptop computer. Also, more mischief from Hong Yin: a house with its very own fish spa. She invited her friends to come enjoy it, and was envious of their delight in re-experiencing the novelty of the nibbling fish. She even invited Mrs. Tan, the Mrs. Tan of the leading Tan family. The matriarchs had not gotten along in life, but their rivalry mellowed in the afterlife. They were cordial, if not friends. “How come you never go before!” Ling Mo exclaimed upon learning Mrs. Lim’s secret. “Too busy,” Mrs. Lim said. “Ah Lim tai-tai was always too busy for silly things like this sort of thing, you know!” Ah Fong laughed. Mrs. Lim didn’t feel like she was enjoying herself much, watching the fish have a go at everyone’s feet. The fish pecked at her feet; she had an internal argument with herself over whether she actually felt them, or whether she pretended to. Her friends gossiped about their children around her, while she intently watched the water. Bite by bite, the fish were supposed to stimulate the chi lines on the foot, and suckle by suckle, they were supposed to slough off old skin from the feet, leaving them callus-clear. But Mrs. Lim was dead; she had no real skin to clear anyway. “Maybe she bought it,” Mrs. Lim said, sloshing her feet into the water, knowing better. During the seventh month that year, Mrs. Lim decided to take advantage of the Underworld’s gate opening for the Ghost Festival. It would be her first time visiting her children. Specifically, Hong Yin. Hong Yin now lived in a Tampines apartment. Mrs. Lim was not surprised to see her daughter living on the other side of the island from the rest of the family, but she frowned to see that it was low-cost housing. She had expected, what with the extravagant gifts, that Hong Yin would be more successful, perhaps even bought a landed house. After all, Hong Yuen, her eldest, had moved into the family home in Jurong as the new patriarch of the family after Mr. Lim’s passing. Hong Wen had bought a luxury condo in nearby Lakeside, although he spent most of the year in Australia. Hong Yin was, to Mrs. Lim’s horror, living with a man. And a practicing Muslim, even! Yet she couldn’t help but drift through the rooms, examining their personal effects: the embroidered Quranic verse on the wall over the front door, the Guan Yin altar facing the entrance, the electric piano in the corner, the ugly couches draped with lace doilies, the unmade beds, the study room where she found Hong Yin. Hong Yin was sitting on the floor, working on some elaborate papier-mâché project. Mrs. Lim glanced at the day-by-day calendar on the wall, pleased to find Hong Yin still used the traditional almanac calendar. But then she frowned: It was a weekday afternoon. Shouldn’t Hong Yin be at the office? Mrs. Lim crept closer to see what Hong Yin was doing. A rollercoaster. The rollercoaster that had appeared last year during Ghost Festival! So this had been Hong Yin’s work? Mrs. Lim had not wanted to ride it. She had never ridden one, even though she had taken her children to the theme parks many times when they were young. She would wait with them in line, then hold their things for them as they got on. The line in the underworld was too long, and she had preferred to join her friends for feasting. Mrs. Lim began hunting for more clues about her daughter’s life now: the planner open on the desk, the paint materials, the pencil shavings filling up the wastepaper basket. Pamphlets pinned to the walls announced exhibitions by Lim Hong Yin going back several years. For a moment, Mrs. Lim was annoyed. All that money for Hong Yin’s education in engineering, gone down the drain! All that hard work impressing onto Hong Yin the importance of a good stable job with financial security, ignored, for art! Mrs. Lim huffed. Yet, she didn’t have it in her to be angry at Hong Yin, who hummed cheerfully as she painted, in delicate calligraphy, the traditional Chinese characters that would bring the joss rollercoaster to life in the underworld. She had loved her children while alive, had done everything a loving mother should have: prepared lunches, picked them up from school, sent them to tuition, sent them to good universities overseas. She had cleaned childhood scrapes and listened to their problems, even if she had not understood them. She had beat them when they were naughty, scolded them softly or harshly as the situation demanded. She had bought them new clothes every Chinese New Year, and made sure they wanted for nothing. Only Hong Yin had been unsatisfied: the only daughter mad at being taught to cook and clean (even though Mr. Lim had hired maids, both he and Mrs. Lim were of the opinion that girls needed to learn how to take care of their families), who cried through piano and violin lessons (she had wanted art lessons, but art teachers were less valuable than piano teachers), shouted at curfews imposed on her where her brothers came and went as they pleased (maybe she had a point there). Hong Yin who spent her time in her room avoiding family events. It would have tired any parent; it tired even Mrs. Lim. Mrs. Lim sat down on the floor next to Hong Yin to watch her now. She had had so many things to do to keep the Lim family’s good standing in their social circles: the endless receptions, the new clothing to buy, the visits with the right kind of people. There were many things she remembered Hong Yin trying to persuade her to do: go for manicures, travel on cruises, and, yes, go to the fish spa. She had no memories with which to draw upon to enjoy them in the afterlife. The afterlife, Mrs. Lim thought, was a place where nothing new could happen, because it is not, after all, a place of living. “Why do you care about such things!” Mrs. Lim cried out in a sudden fit of spite, the only way to relieve her frustration she had, then and now. Hong Yin jumped up in startlement, as if she’d heard Mrs. Lim, who hoped that she had. She stared at the rollercoaster in disbelief, then looked around the room wildly. Her hands across her chest gripped her arms so tightly the smeared paint was starker on her fingers than before, a gesture Mrs. Lim recognized as something Hong Yin did only did when she was being shouted at. Mrs. Lim had a moment of self-righteous satisfaction that even in death, she could make Hong Yin feel her displeasure, but even that dissipated when Hong Yin crumpled against the wall, crying. It hadn’t been uncommon for Mrs. Lim to encounter Hong Yin weeping for no apparent reason, and the familiar discomfort roared to the fore, of the guilt at partaking in the pain, of the helplessness at the unfixable. “I’m sorry,” she said. She squatted next to Hong Yin. “I didn’t know. I still don’t know. I just wanted you to be happy.” Mrs. Lim thought she had known the best way to be happy, and she had thought it would be good for Hong Yin. But it had not been, and now this gulf of difference yawned between them. What if she had done something different? What could she have known? She stayed until Hong Yin stopped crying and began working again. The rollercoaster was done, it seemed, since Hong Yin carefully moved it into a corner and began work on something new. Careful fingers unfurled rolls of delicate joss paper in many colours that stained. The calligraphy brush glided effortlessly across surfaces, with well-wishes and poetry. The rustle of papers as they were crumpled, folded, glued, and set pushed against the silence of the room. A garden, with large rocks, a pathway, and a little pond with its own ducks, spread out across the floor. How Mrs. Lim had always wanted one, always sighed about having one to her husband who had refused due to feng shui. She had joked, on her deathbed, that she hoped before she died she would get a beautiful garden. Hong Yin had gamely sat down with her with a pen and paper, sketching out the details. They had said nothing about how it was only towards the end that they could set aside their differences and resentments. What was there to say that could have closed that gulf? It was too late then, so they had to do the best they could. And true to her quirkiness, Hong Yin added steps into the pond. Mrs. Lim rolled her eyes to find it was yet another of those ridiculous fish spa things, but outdoors, surrounded by natural beauty . . . and what looked to be a full-body experience this time. At least Hong Yin was happy, and Mrs. Lim couldn’t find any fault with the aesthetics of the garden, really. It was perfectly balanced to Mrs. Lim’s tastes. Mrs. Lim said goodbye without the fanfare that had accompanied Mr. Lim’s departure from the underworld. Ah Fong, Ling Mo, and a few other old friends followed her to Meng Por’s pavilion at the edge of the chasm. They had to wait in a long queue, during which her friends tried to persuade her to not leave. After all, didn’t Mrs. Lim have some of the best real estate in the Underworld? Without her there to enjoy it, the property would fade, unused cosmic energy returning to other states. Mrs. Lim felt that her friends secretly wanted to keep enjoying her things. “Are you sure?” Ah Fong burst out, when it was finally Mrs. Lim’s turn. “Yes,” Mrs. Lim said firmly. Then she stepped up to Meng Por’s table to take the proffered cup. 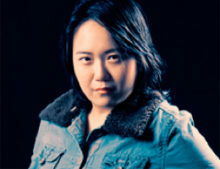 Jaymee Goh is a writer of fiction, poetry, and academese. She is currently a PhD Candidate at the University of California, Riverside where she is affiliated with Science Fiction and Technoculture Studies and Southeast Asia: Text, Ritual and Performance. Her work has been published in Expanded Horizons, Stone Telling, and Crossed Genres. 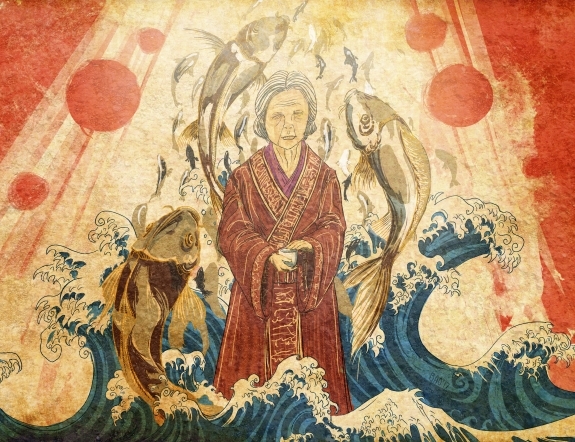 She is an editor of The Sea is Ours: Tales of Steampunk Southeast Asia (Rosarium Publishing). She has written on racialized and postcolonial steampunk for the WisCon Chronicles (Aqueduct Press), co-written an essay on steampunk fashion and race for Fashion Talks (SUNY Press), and contributed to Tor.com, Racialicious.com, the Apex Book Company Blog, Beyond Victoriana.com, and Steampunk III: Revolution (Tachyon Publications). She tweets a lot: @jhameia.